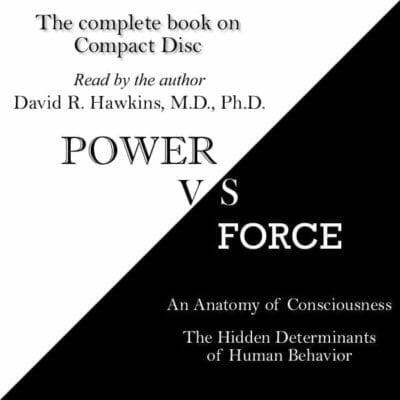 Written and read by the Author, David R. Hawkins, M.D., Ph.D.
A rare gift from Dr. Hawkins to enable the listener to receive the full impact of this monumental work. The first of the series of his books read by the author himself. Imagine—what if you had access to a simple yes-or-no answer to any question you wished to ask? A demonstrably true answer. Any question . . . think about it. We think we live by forces we control, but in fact we are governed by power from unrevealed sources, power over which we have no control. The universe holds its breath as we choose, instant by instant, which pathway to follow; for the universe, the very essence of life itself, is highly conscious. Every act, thought, and choice adds to a permanent mosaic; our decisions ripple through the universe of consciousness to affect the lives of all. Note: The audiobook of Power vs. Force is available for downloaded from iTunes for $44.95 – a $25.00 savings off the compact disc price. To purchase the download, visit iTunes.